The largesse (largeness?) of spring. Infinity is just so big that by comparison bigness itself looks really titchy. O riotous spring! My hayfever has hayfever, and the three of us (because of course the two hayfevers are their own monstrous entities) have a cold on top of it all. I’m fairly certain I’m a walking medical miracle. I mean, hayfever + hayfever + cold and I’m still functioning-ish? My allergist needs to get on publishing that research – he could be retiring to the Caymans in no time. Although it’s probably reasonable to state that we had a more “accurate” winter than we usually do (lots of cold and snow versus a ton of Chinooks and dry, exposed earth), it felt impossibly huge and long and draggy and we. are. officially. (probably. sort. of. maybe). done. with. it. The photo says it all. 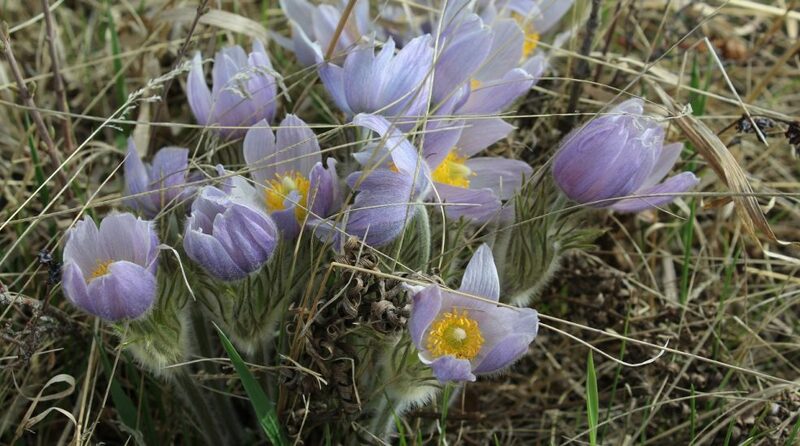 The Prairie crocuses are blooming like mad all over the sunny slopes and despite the incessant sneezing and sniffling, life is pretty awesome. In the foreground: a new view of marsh smartweed, a plant I profiled on Flowery Prose around this time last year. (Take a look at my original post here, along with a close-up view of the flower). I shot this photo from our boat as we followed the northwest shoreline of McGregor Lake (near Milo, Alberta), on a crazy hot and smoky August afternoon. I’m not certain of the ID of the large reeds in the background; I’ve done some tentative digging but haven’t come up with anything conclusive. I’ll update this post if I can find out any more info about them. I wonder how much soil is under that rock? I’m guessing, not much. And I’m not showing it in this photo, but there was snow clinging to the rocks just southeast of where I was standing. In July. This common willowherb (Epilobium ciliatum), a close relative of the (ahem!) even more common fireweed (Chamerion angustifolium*, also known as rosebay willowherb), is a mountain plant with heaps of beauty AND brawn. *In another case of Nomenclature Gone Wild, fireweed was previously known as Epilobium angustifolium. I can’t yet find an explanation as to why the genus name was changed for this plant and not for common willowherb…but I’ll keep digging. Yes, this plant is about as common here as wearing socks…well, except it’s summer and a blisteringly hot one at that and everyone is currently shod in sandals and…where was I? Yeah. Wild bergamot, sometimes called horsemint. Monarda fistulosa (syn. M. menthifolia, M. bradburrana). Socks in winter. Ahem.